Hello Jammers, We are sorry to announce that the Brunch has been postponed to Sunday April 10. Please accept our apologies for any inconvenience that may have been caused due to this. Follow the link below for more details. 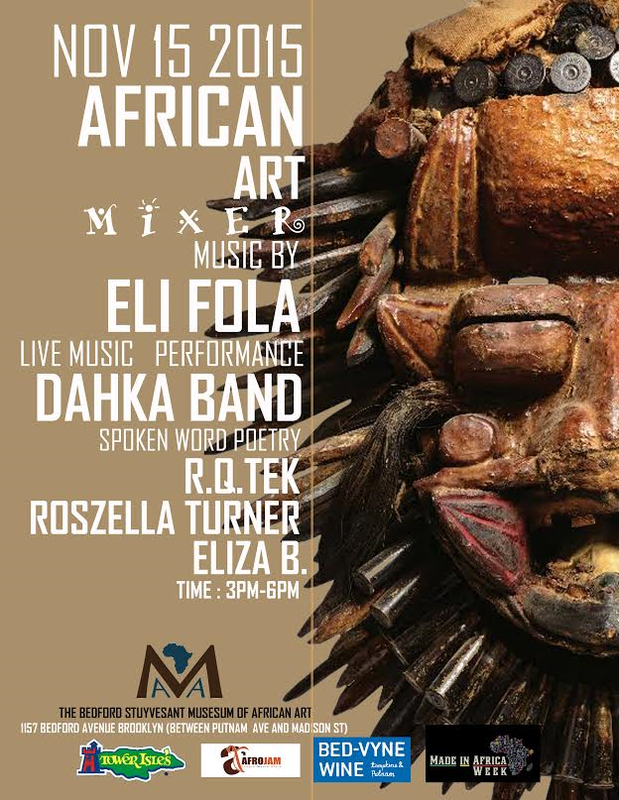 The Bedford Stuyvesant Museum of African Art in conjunction with AfroJam will host an African Art Mixer on Sunday, November 15from 3 p.m. to 6 p.m. at 1157 Bedford Avenue, Brooklyn (between Putnam Avenue and Madison Street). Admission is FREE with RSVP, however a donation* of at least $10 is recommended. (Feel free to give more). The event will highlight the museum’s unique collection of artwork from more than 40 of the 54 African countries. (Private walk-thru tour by Vira L. Jones, CEO of The BSMAA). The BSMAA is dedicated to creating educational and cultural enriching programs that will educate the youth and inspire them to develop an appreciation for the ri…ch culture, history and art of Africa.